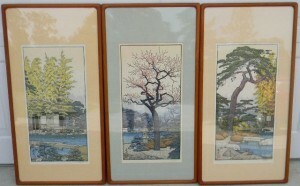 The Japanese woodblock print triptych The Friendly Garden by Toshi Yoshida has been added to the gallery. 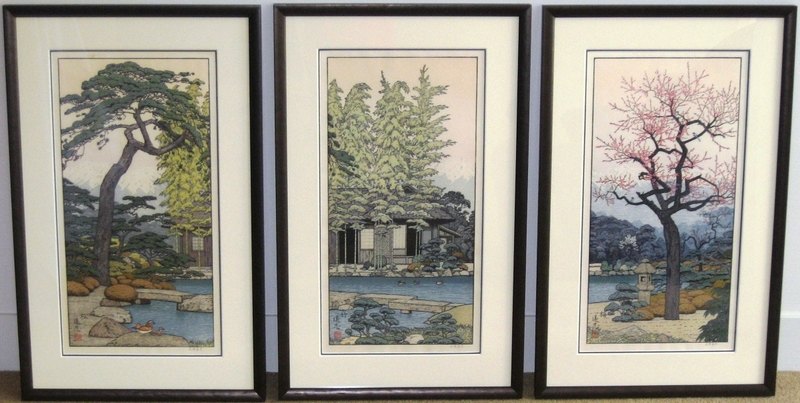 The three woodblock prints show the Yoshida family garden. 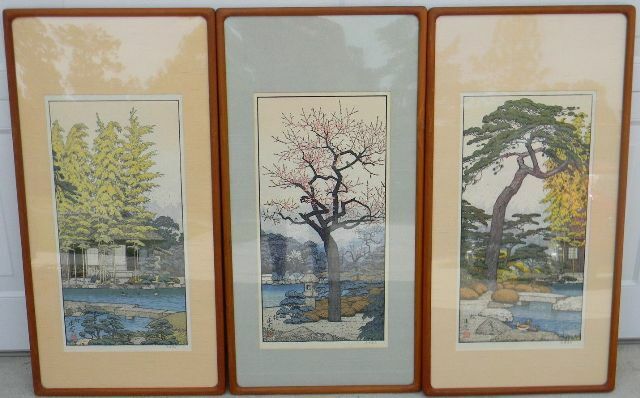 The left hand woodblock print is titled “Pine Tree of the Friendly Garden”, the middle print titled “Bamboo Tree of the Friendly Garden” and the right hand print titled “Plum Tree of the Friendly Garden”. 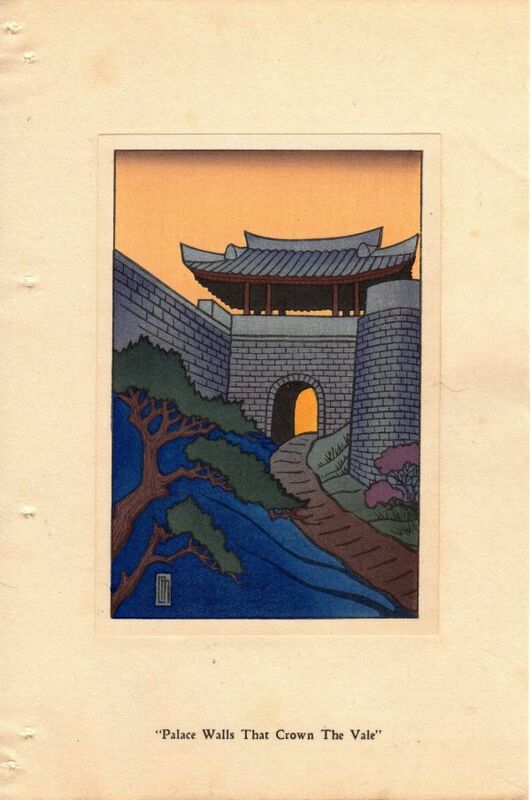 The frames and matting shown in the gallery picture for these woodblock prints is not original. 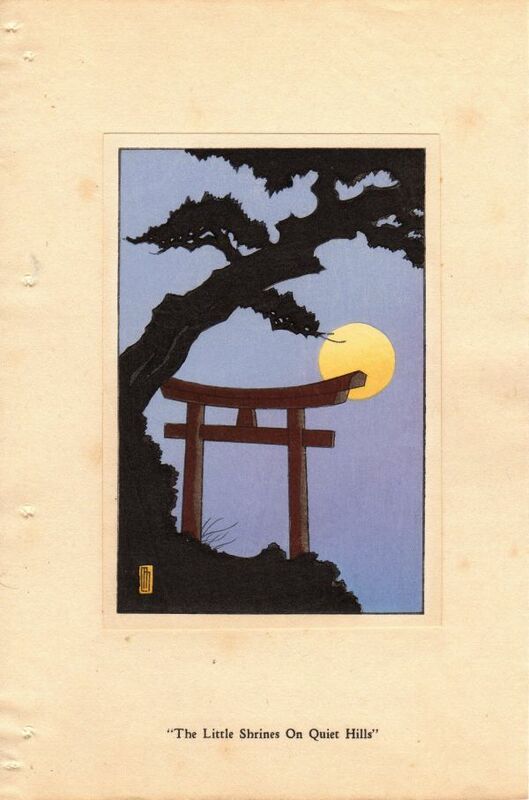 The triptych was produced by Toshi Yoshida (his only one I believe) in the Yoshida studio and distributed by the Franklin Mint Gallery ca 1980. 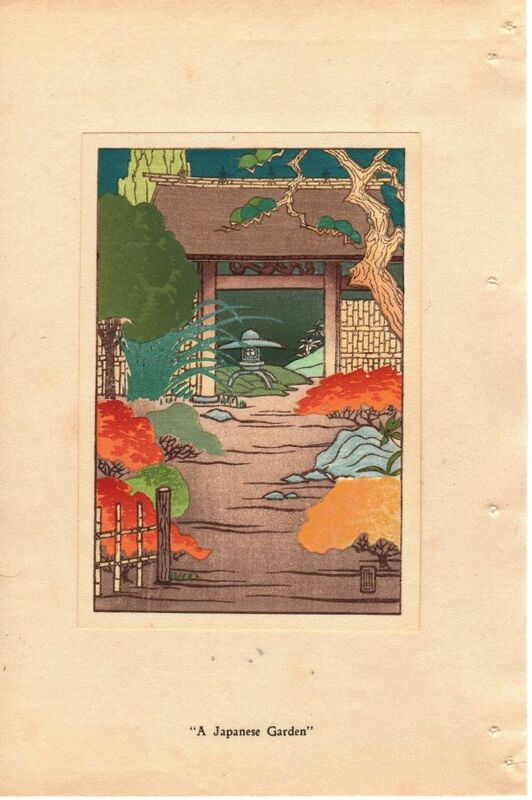 One would assume the tie-up with the Franklin Mint Gallery was to broaden the appeal of his (or maybe Japanese woodblock prints in general) work in the US. Interestingly the prints were pencil signed in Japanese as opposed to the usual Toshi Yoshida western signature perhaps to add a more ‘exotic’ feel. The prints were sold in teak frames with acrylic ‘glass’ and mat boards covered in silk. Some of the framing materials are not archival so you should replace them if possible. Of the Toshi Yoshida Franklin Mint Japanese woodblock prints I’ve “de-framed” most of them used something akin to sports tape to tie the print to the mat board. Many of the prints had some damage in the top margin due to this and my framer also advised (some of?) the boards were not acid free. If you do look at getting these woodblock prints remounted using archival quality material you may find that as the teak frames are quite shallow the new materials will stick out past the frame at the rear but that’s not noticeable when hung. One common ‘quirk’ with the triptych to watch for is that the colouring of the bamboo tree’s can differ between the left hand (Pine) and middle (Bamboo) prints where-as the colouring of the Pine tree which extends from the left print (Pine) into the middle (Bamboo) is consistant. A further thing to note is that the silk covering on the mat boards appear to have come in different colours and occasionally some sets for sale have more than one colour! If your interested in obtaining Toshi Yoshida’s The Friendly Garden Triptych they do come up periodically. Searching in Google or ebay will usually find one but you may need to be patient. Prices vary from $247USD (the cheapest I’ve seen) to around $1600USD at a web gallery. 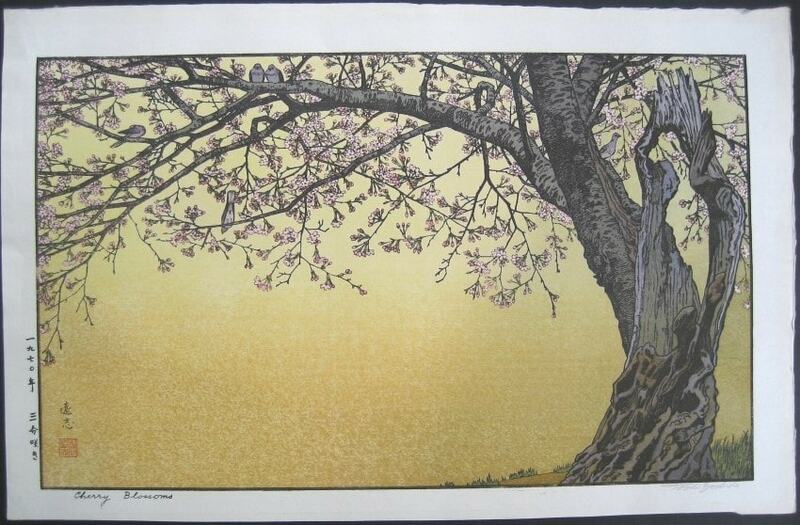 I also have three of the four Japanese woodblock prints from his birds of the seasons series which you can view here Toshi Yoshida Franklin Mint Birds of the Seasons. There was also a birds series (I have one of the series) but on smaller paper. Yes, I believe there may have been around a dozen in the series and they were likely to be chuban size. I’ve seen the occasional print from the series but have never seen anywhere a complete set. If anyone knows of a site displaying the full set of the chuban sized birds series it would be great to hear about it. I’m jealous. There don’t seem to be many full sets around so acquiring them piece by piece seems to be the only way to get the set. I did find all twelve on an auction site so ‘borrowed’ the pictures from there and uploaded them to here https://www.japaneseartsgallery.com/2012/11/toshi-yoshida-franklin-mint-calendr-prints/ for reference purposes. 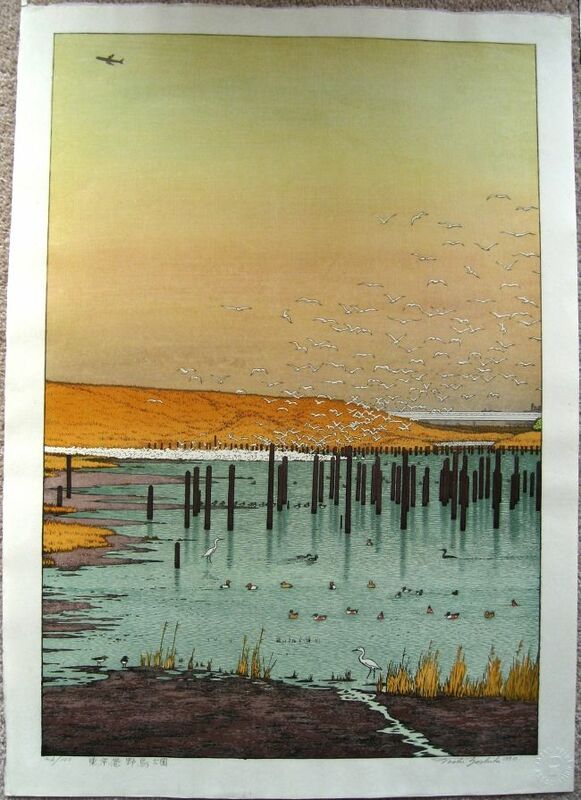 I have one of the Triptych Yoshida prints for sale. It is the Pine tree with Bamboo in the background. The print is also in the original teak frame. Excellent condition too. Email if interested. Thanks for the offer but I’m not currently looking for any Friendly Garden prints. Can you send me photo’s of the prints. 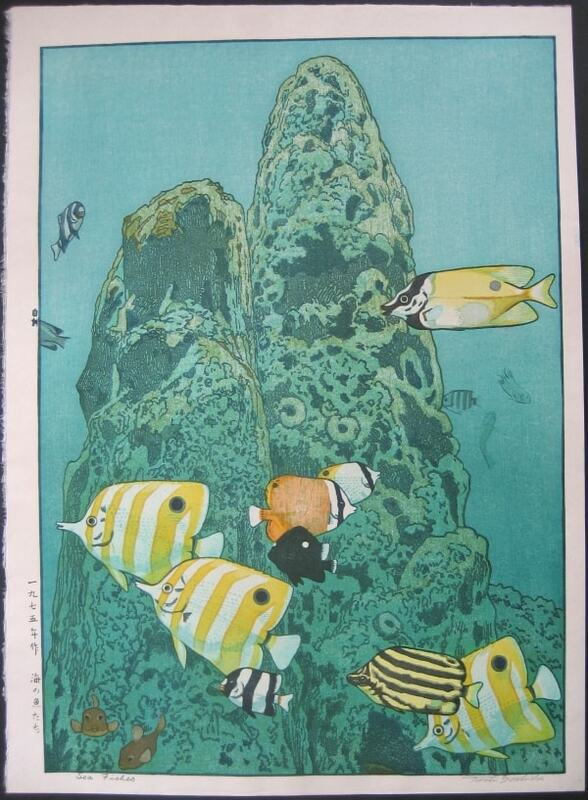 Use the https://www.japaneseartsgallery.com/contact-us/ page which allows you to add attachments. I am interested by the Friendly Garden, but first of all does any body knows how many triptyque were printed ? I’ve never seen any indication how many copies of the Friendly Garden series were made. The prints did originally ship with some documentation including a COA from Franklin Mint so it’s possible an edition number may be shown there. I am looking for Plum Tree of the Friendly Garden for a client. They have the other two woodblocks from the set. Please let me know if one is available somewhere that you know of. I’m not aware of a Plum Tree print available at present but they do pop up on eBay, Live Auctioneers and Invaluable etc from time to time. I’ve had the same issue previously so I gave up waiting, bought a full set, kept the prints in best condition and sold off the two ‘duplicates’. My name is James Hensley and I am getting to ready to place a nice set of the Friendly Garden triptych prints on ebay. They are in excellent condition, with one having a bit of slight waviness on the bottom margin, but no obvious discoloration. They are in the original teak frames. I would consider all offers…thanks. If anyone contacts me about your prints I’ll pass their details on to you. I have only seen these with either a blue or a tan mat. Are there other colors? I’ve only seen two colours as well.